From a nutrition standpoint, grilling is a great way to prepare foods because it uses very little fat except to add flavour, in limited amounts, if you choose. Also you don't lose nutrients in the cooking water as you do when you boil vegetables, which is the go-to vegetable prep method for a lot of people. Cooking al fresco -- one more reason to love summer. From a nutrition standpoint, grilling is a great way to prepare foods because it uses very little fat except to add flavour, in limited amounts, if you choose. Also you don't lose nutrients in the cooking water as you do when you boil vegetables, which is the go-to vegetable prep method for a lot of people. From a taste standpoint, grilling is a great way to seal in flavour and give that smoky vibe to your meal. Of course, if you don't have access to an open grill you can always grill in the oven for a similar outcome, although arguably not as flavourful as the real thing. Do take it outside if you can: you can enjoy the summer weather and you won't be heating up the house with a hot oven. Other benefit -- less mess in the kitchen! 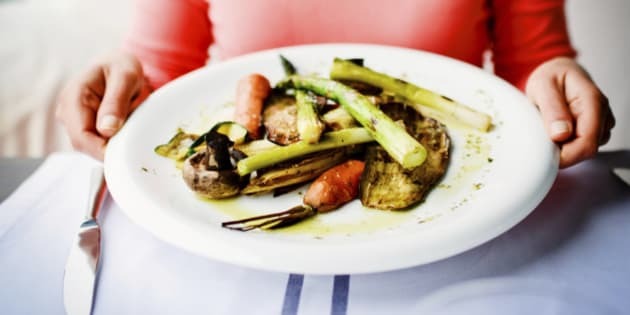 We tend to think of meat when we think of the grill, yet vegetables are also fantastic grilled, especially after a long winter of bland and boiled! I confess, head bowed in shame, that I have never been a big fan of vegetables. I know, I'm a dietitian; we're all about vegetables and I eat them, I just don't usually love them. But since I discovered grilled vegetables, I actually do love them! There are a variety of ways to cook veggies on the grill. Basic prep involves removing the hard bits you don't want to eat and adding seasoning. You can also lightly spray with olive oil. Wrap the vegetables in foil, forming a "pouch" (you can place accompaniments like fish, mushrooms or small potatoes in there too) and place them directly on the grill, in the foil pouch. Alternatively, simply place them in a shallow heat-safe container and add your dry seasoning and olive oil. That's it! Grill away! Keep an eye on them that they don't burn. Corn on the cob is scrumptious on the grill -- for best results cook with the husks on, to seal in the flavour and moisture, and peel back afterwards (the husks also form a nice receptacle to hold the cob in, while eating). Once cooked and removed from the grill, brush the corn with butter or non-hydrogenated margarine. Hint: for a touch of sweetness, stir some honey into the butter/margarine -- this is a crowd pleaser! Zucchini and asparagus work well on the grill, as do tomatoes. Grilled tomatoes are delicious; flavourful and juicy. Plus, you get the added benefit of lycopene -- a phytochemical with significant antioxidant properties that increases in tomatoes when you cook them. Another food you may not think of when you think of the grill is greens (mustard, collard, spinach, kale, etc.) yet these too can be cooked on the grill and it's an interesting way to serve them, especially greens like kale and spinach that tend to be a little tough and sharp tasting when raw. Grilling will bring about a nice moist texture, while sealing in flavour. Place greens in a bowl such as a stainless steel colander, and place the colander on the grill. Cover with a lid or a bowl for about a minute to accelerate cooking, as well as trap some of the smoky flavour. Once you remove the lid, give the greens a stir and keep an eye on them that they don't char. Leaves will start to wilt down (so start with lots!) and get deeper in hue. Make sure to keep stirring so the greens get uniformly soft and moist, and remove from the grill. before they start to get crispy (unless of course you want kale chips! ), or start to turn brown or black. Season with additional herbs and/or lemon juice if you wish. Grilled greens can be enjoyed as a side dish, or make a great bed on which to place other foods such as cooked fish or quinoa, or bean salad. They can also be used in place of a starch for a light, healthy summer meal. Now I'm really all about vegetables, so it's a story with a happy ending. Go summer. A previous version of this post had mistakenly advised the use of hydrogenated margarine, when the author intended to recommend non-hydrogenated margarine.